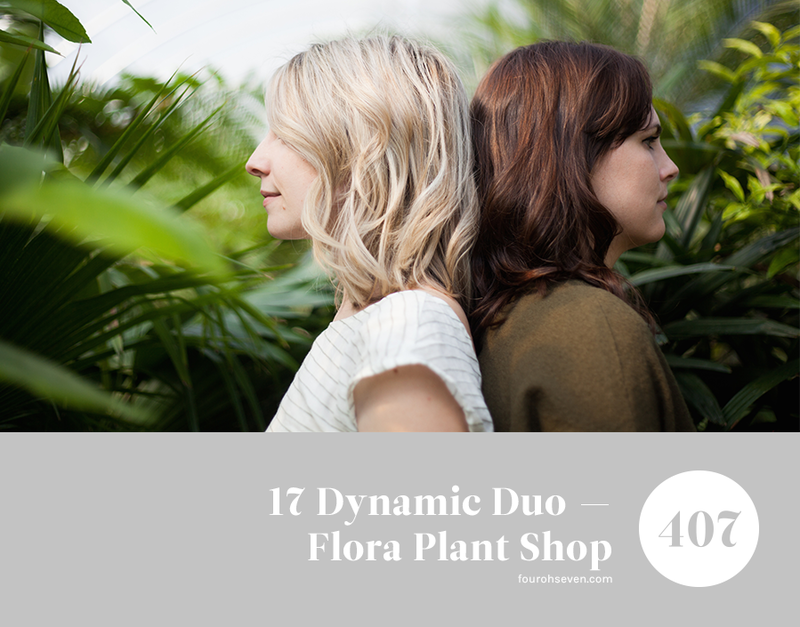 Flora is owned by Kate Holl and Kerbi Howat, two friends who joined forces to bring the first specialty plant shop to Nashville, TN, as well as have a fresh start in their career lives. The shop offers specialty house plants, event rentals, and consultations. But prior to opening their brick and mortar location and less than a year into their friendship, the two traveled around town doing pop-up shops in a teardrop trailer. The pop-up was a great way for them to get our name their there and see if there was an interest in something like a specialty plant shop. A lot of trial and error and a VERY brutal Tennessee summer led them to what Flora is today. 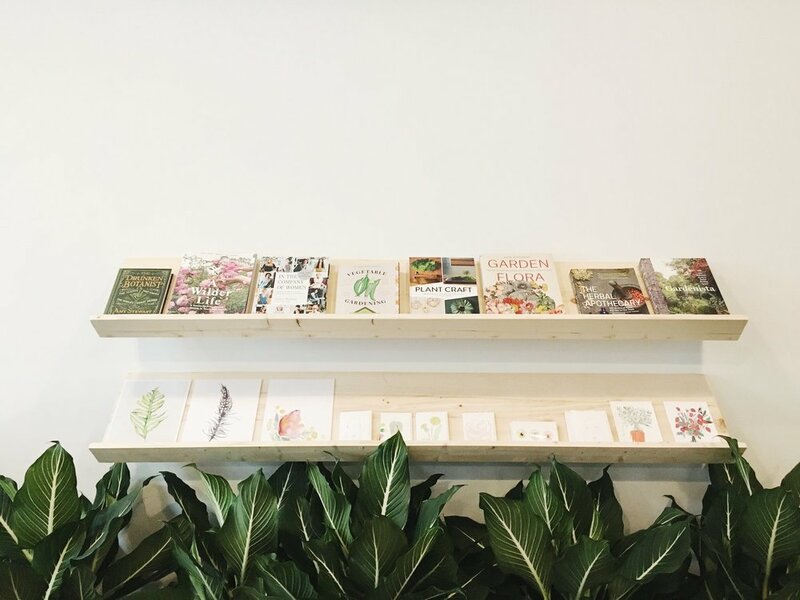 Keep scrolling to hear their partnership story and take a peek inside their dreamy shop in East Nashville. Kate: Collaboration is a huge part of our relationship as business partners so it was important for us to make sure we carved out time into our weeks to bring ideas to each other and tackle problems together. During a 3 month pop-up over the winter at the Nisolo Showroom we hardly ever got to see each other. It was awful! We missed each other! So when we got our storefront in March of 2017 we made our schedules overlap 4 hours every day during the week to make sure we are able to bring everything we need to to the table and to also catch up, unload grievances, and just maintain our friendship. Many times ideas, creative or otherwise, come to us while we're a part (many times, unfortunately, right before bed) - we look forward to getting together to talk it all over whether they're thoughts of worry or excitement. Having a partner to share the joys of success and creative bursts is just as wonderful as having a partner to share the burden of stress and work through problems. Kerbi: I love our partnership. When we started Flora, Kate and I barely knew each other. We were new friends who would get together to encourage each other in our respective journeys. That relationship has grown as Flora has. I think we lucked out that we work so well together and are also now such great friends who truly love and enjoy being around each other; but I also think the fact that we didn't know each other very well at the beginning is a big reason we are so successful as partners. As we learned how to run a business and the directions we were taking it, we learned a lot about each other- how we like to communicate, what our needs are, what we like and don't like about running a business. I also like to say that we have our own language. Before we got our brick and mortar, we were a pop-up shop. We could set up our pop-ups without even speaking. We also almost always have the same perspective or opinion on something. Always on the same page. Daily, we bounce ideas off of each other. We talk each other off proverbial ledges. Running a business is an emotional roller coaster and Kate always tells me it's going to be ok and I believe her. Kate: I often tell people Kerbi was the missing piece to my entrepreneurial puzzle. I had this unformed idea of a business in my mind and I had Kerbi there telling me I could do it. One night (of course, right before bed) it dawned on me that we should do this together. Kerbi is such a doer, without her Flora would have never gotten to where it is today. But that's not to say Kerbi isn't a dreamer, she absolutely is and it would be such a mistake to think otherwise. Often times we balance each other out, when someone is worried about something the other person can almost always put their mind at ease. I couldn't imagine doing something as emotional and draining as opening a business solo. Kerbi: When we started Flora, working with plants was something Kate had been bouncing around for quite a while. I had been encouraging her to do it but it never crossed my mind to be a part of it as I was working in a completely different industry. Right before we decided to partner, I had quit my job and was looking for a fresh start. Kate asked me if I wanted to start a business with her and I said yes. It was an easy decision. Kate: Right now we both wear so many hats at Flora since we're small but growing - and it's our baby! We have immense respect for each other so we always are wanting to run things by each other. I think eventually we'll get into a rhythm that doesn't require so much communication about the little things (or be able to hire someone to take on some of our many roles). I'm looking forward to that leaving room for a new phase of creative collaborating on Flora's next steps and expansion. Kerbi: I honestly don't feel like I have faced any big challenges with Kate. I think, as with every relationship, you're learning who that person is all of the time. You're learning how they like to communicate, what they like and don't like, what makes them sad, what they believe politically, what offends them, what they're afraid of, what makes them insecure, what inspires them, what fulfills them. It's important to learn all of these things, be conscious of them and respect them. Kate and I have a true respect for each other and I can't imagine working this closely with anyone else, as successfully. I've definitely worked with people who, through no fault of their own, just weren't a good working match for me. Kate: The friendship that grew from it. Kerbi and I barely knew each other when we started Flora. We had only hung out a handful of times but every time we did we had inspiring and uplifting talks which made me have no doubt about what we were doing together. I'm not saying that would work for everyone, that you could start a company with any acquaintance and get a best friend and successful business out of it, but it happened for me! I was also surprised by how funny Kerbi is and that she doesn't like caramel. Kerbi: It has surprised me that it has gone so well for the last year and just keeps getting better! It can be so difficult to work with others. Having a business partnership is a lot like a marriage. They see your best and your worst. Kate: A couple come to mind! Bernie Sanders and Killer Mike - what an interesting, amazing, and important dynamic duo. Oprah & Gayle cause damn, that friendship has stood the test of time. Kerbi: This is a really tough question! The first one that popped into my head is Bill and Melinda Gates. They have used their huge success to give generously and try and tackle some of the worlds biggest problems in practical ways. I believe with great success comes great opportunity and great responsibility. They inspire me. The internet is magic. Here’s a little list of things I've loved from around the internet world lately — friends doing great things, smart things from smart folks, and things that just made me smile. 01 — What are you dying to redesign? This got my mind buzzing. 02 — One of my favorite bosses. 03 — What do you want to learn today? Course List is a curated directory of 32 (and counting) online courses. 04 — Constantly striving to make more space for compassion in our biz. 05 — FAVORITE thing I read this week. 06 — Why we need white space in our lives and not just design. 01 — A new competitor for Slack and I think I'm sold. 02 — Plan BEYOND whatever milestones you’ve set for yourself so your hard work can be sustained. 03 — Design around the world. 04 – I love me a good interview and this site is full of them. 05 — How do you draw a circle? 06 — I think Diana just inspired me to create a "random art I love" post. 01 — A non-writer's guide to owning writing. 02 — How does this make you feel? 03 — I try to ask when I’m reading: Will I care about this a year from now? Ten years from now? Eighty years from now? I'll admit, this is a slightly ironic link to a linked post. 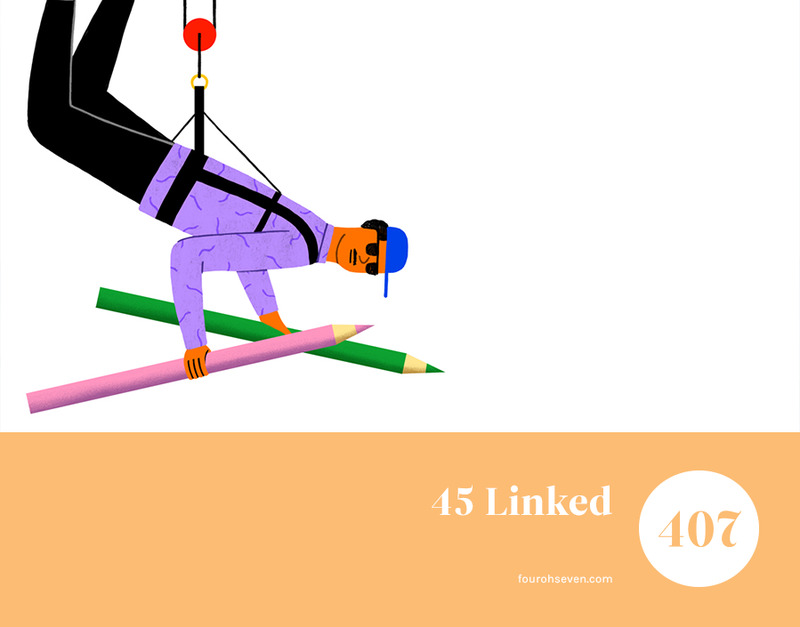 04 — Wes Anderson in real life? Yes, please. Fun fact — my favorite film ever is Grand Budapest Hotel. 05 — Ladies, Wine & Design is one of my very favorite meetups that I've been to in Nashville. And yet every month, I get introvert cold feed right before. But then I read this and I go. 06 — Three of my very favorite ladies who are boss: Jen Gotch, Ellen Bennett, Jeni Britton. When I moved to Nashville two years ago, I quickly looked to replace all of my old St. Louis favorites. A new go-to for coffee, a new weekly dinner spot and a new place to escape. And behind a bold pink door in the Germantown neighborhood, Poppy & Monroe filled the void of the last one. Owners Sherri Coates and Karen Kops wanted to create a welcoming destination that combined their love of beauty with their commitment to health and well-being. And they've done just that. The clean beauty collective specializes in nails, skincare, makeup and sugaring services. 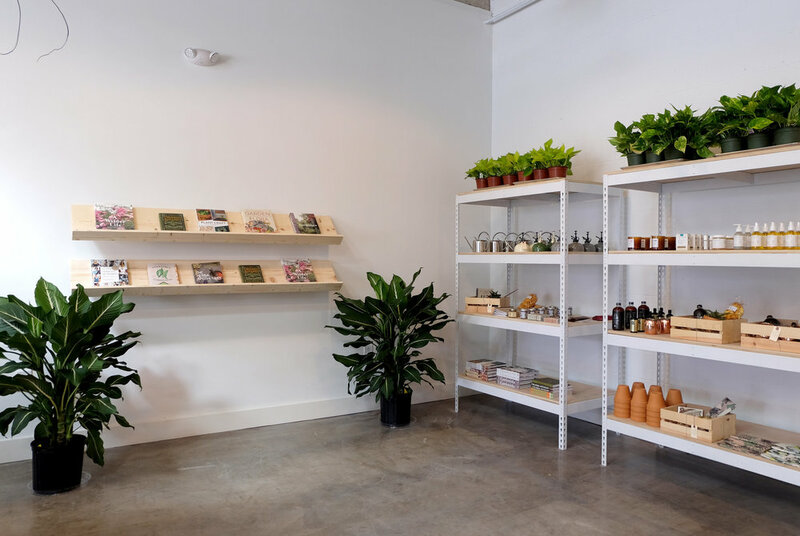 Poppy & Monroe also offers a full boutique stocked with the best green beauty products on the market as well as jewelry, handbags, gifts and more. We're thrilled to welcome Sherri + Karen to our Dynamic Duo series, sharing the story of their partnership at Poppy & Monroe. Karen: We are in the shop together every day and we are constantly communicating via text and email when we aren't. We are trying to get better about making regularly scheduled strategy meetings off-site so we can work without interruptions. Our goal is at least every other week.. still working on this one! Sherri: We're so fortunate in that we definitely draw on one another's strengths and make up for what we may be missing. We've defined our roles at this point, execute as best as possible so operationally, we run as smoothly as we can, while keeping our collective focus steady on the big visions we have for the future and we have lots!! Sherri: We met at just the ideal time when we were both looking to change our work and life balance. We made it to the top of our games so to speak but we were just running the rat race at such a pace that we weren't enjoying life, our families, friends and all those important priorities especially our health and well being. It's been great for us being new partners and friends because we didn't come in with any preconceived ideas and so we've been on a great adventure not only running the business together but learning about one another. I couldn't have asked for a better partner whom I trust completely and I know has my back! Karen: Understanding our communication styles. Sherri is very direct whereas I'm a bit softer in my approach. I'm also one to overanalyze where Sherri's able to make quicker decisions. I think there are positives and negatives to all of these traits and I've learned a lot from her. Sherri: We have such different personalities and approaches so we had to really learn to be open to our differing outlooks and opinions. We also had to learn how to communicate with one another, as we've never worked together before or knew each other socially. We're both so flexible and put in the hours equally so we tend to come to good decisions together having so much respect for the other. What’s surprised you most about your partnership? Karen: That we both have the same passion for what we are doing. I realize that's incredibly difficult to find especially when you haven't known one another very long. Sherri: How different we are but the same too. We knew aesthetically, even down to the design of our space, we were in agreement (which was great and made things so much easier!) on so many things but it's the little things in the daily running of the business that surprises us each day. How we deal with customer service, employee issues, competition all while trying to grow our business challenges us daily, but for the better we feel. Karen: Thelma & Louise - we are total opposites in many ways yet we are always there to support and build each other up. There's no one else I'd rather go on this crazy ride with! Serri: Well everyone knows how much I love Justin Timberlake so I would say he and his wife Jessica. They just moved here in Leipers Fork and I'm dying to meet them! I just think they seem like they have such a fun time together while being so sweet and supportive of one another. They seem to have that great blend of being each others BFF and all else. It's inspiring plus they both still pursue their individual endeavors which says a lot for two strong creative types. 01 — Freeing your identity from the limits of validation. 02 — Best "business" blog post that I've read recently. 03 — I'm a big fan of most any interview series. 04 — How many things on this list do you need to give up? I've got a few. 05 — I'm a big people pleaser, both personally + professionally. I'm going to work on adding this phrase into my vocabulary a little more. 06 — I would like all the posters, please. 01 — Your intuition is more powerful than your intellect. 02 — Adding this guy and this guy to my wishlist, one for Monday and one for Friday. 03 — A checklist for handing off design files. 04 — Anything I find on Beyonce will probably always make a Linked list. 05 — A dream gig with Southwest. 06 — You can make excuses or you can make progress. 07 — Do you struggle with being a people pleaser? I do.